Scorpion was born Hanzo Hasashi to the Shirai Ryu clan of ninjas and assassins. Hanzo's father was a former member of the Shirai Ryu and forbade his son from joining the clan, but Hanzo saw a way to give his own family comfortable life and so he joined against his father's wishes. Hanzo was trained and became a highly skilled killer for the clan and earned the nickname "Sasori" - Japanese for Scorpion. Scorpion had fought for the honor of the Grandmaster and the Shirai Ryu clan itself and was considered one of the clan's best by age 32. Hanzo's life began to change when a necromancer named Quan Chi hired the clan to retrieve the Map of Elements from the Order of Light's Shaolin Temple. This map would lead the sorcerer to the Amulet of Shinnok, though Quan Chi would need a human to enter the temple where it was housed since magic prevented magicians, sorcerers, and necromancers like himself from entering. Hanzo set out to honor his family and clan by completing the mission. Unbeknownst to Hanzo, Quan Chi had gone to the Shirai Ryu's principle rivals, the Lin Kuei, who sent an assassin named Bi-Han a.k.a. the elder Sub-Zero. During the mission, both Hanzo and Sub-Zero would run into each other and being from rival clans naturally did battle. Sub-Zero emerged victorious and Hanzo was killed. 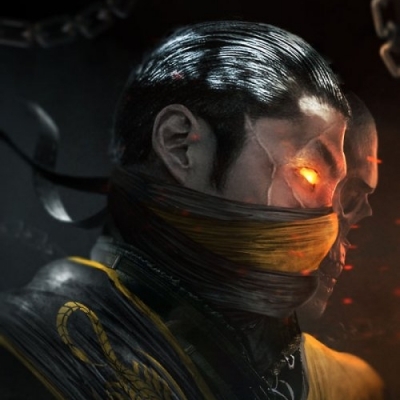 His soul tainted by his acts as an assassin and his "association" with Quan Chi, Hanzo descended to the Netherealm where he was reborn as Scorpion, the Ninja Spectre of Vengeance and Quan Chi's enforcer. Unknowingly, Scorpion began working for the killer of his own family and clan, as Quan Chi had murdered them as payment for the Lin Kuei's services. When Scorpion was reborn, he was led to believe that the Lin Kuei were the ones responsible for this. Scorpion swore revenge on Sub-Zero. Scorpion would later encounter Sub-Zero, who was trying to retrieve the Amulet on Raiden's orders, when he was imprisoned in the Netherealm by the Brotherhood of Shadow. They battled again, and Scorpion was defeated once more. Enraged and humiliated, Scorpion would prepare to murder Sub-Zero when he would get the chance in the Mortal Kombat tournament. "I may not be an Elder God, nor am I a sorcerer who would rather rely on pawns to do their own bidding, but I am a one man army. From the hellflames of the Netherrealm, I have returned for a single purpose: to fulfill my destiny by avenging my fallen clan. My own blood is fueled by my thirst for vengeance and I will not rest until I have murdered the one responsible for the Shirai Ryu massacre." Q. "Have you finally pushed our rivalry to the side or does anger still blind your soul?" A. "The Lin Kuei have slaughtered my family and clan, Your brother, Bi Han may had led the charge. But I will refuse to rest until I've killed every last one of you."